The last post examined the characteristics of the large group of men who enlisted together on 16 September 1914 at Yarram, and then left for Melbourne by train on 21 September 1914. While this group was certainly the first such group from the Shire to enlist – and it remained the largest single group of recruits throughout the War – there were other men who had enlisted, as individuals, prior to this. This post looks at 22 men who enlisted outside the Shire, as individuals, sometime between the declaration of war on 5 August and the departure of the train from Alberton on 21 September. Once again, the research surrounding the lives of these men reveals the complex dynamic between the nature of work for the rural working class and the idea that personal identity can be tied to a particular location. The first table here identifies the 22 men who enlisted, individually and outside the Shire, prior to 21 September 1914. The men have been identified via 2 main sources of evidence, which for present purposes I have termed ‘hard’ and ‘soft’. The hard evidence relates to formal record sets. The most commonly referenced piece of hard evidence is the Alberton Shire Honor Roll (Shire Honor Roll) [HR]. This official record was drawn up at the end of the War and records the names of 447 men. The second piece of hard evidence in the Shire of Alberton Medallion (Shire Medallion) [Med]. This was presented to each man from the Shire who enlisted. The actual medallion is featured on the blog. The third piece of hard evidence is the relevant electoral roll [ER] from the time, which recorded the full name, occupation and place of residence for each registered voter. Lastly, for relevant cases, I have included reference to the Shire of Alberton War Memorial (Shire War Memorial) [WM]. The memorial is located in the main street of Yarram and records the names of 79 men from the Shire. Future posts will look in detail at each of these record sets, highlight any problems associated with their use and explore inconsistencies and gaps between them. The soft evidence is anecdotal and relates principally to references in articles from the local paper, Gippsland Standard and Alberton Shire Representative. On the table there are 15 men whose association with the Shire is tied to hard evidence and 7 where the link depends on soft evidence. The 7 cases are highlighted. For 10 of the 15 locals linked to hard evidence, the key piece of evidence is their inclusion on the Shire Honor Roll. For another 2 it is their receipt of the Shire Medallion. For another 2 it is an entry in the electoral roll. And for the last man it is the inclusion of his name on the Shire War Memorial. Some men are linked to more than one piece of evidence, but only 1 man – William Newland – is linked to all relevant pieces. A brief review of these 15 cases highlights a range of apparent gaps and inconsistencies. For example, it is odd that men who definitely did receive the Shire Medallion are not included on the equivalent Honor Roll. This applies to both Samuel Gay and George Silver. There is an even more striking omission involving Nathan Hepburn. He was born in the district but had obviously moved to Queensland. He enlisted in Bundaberg in August 1914 and was killed in action (28/6/15) just 10 months after enlistment. His name does not appear on the Shire Honor Roll and there is no record of him – or his family or relatives, on his behalf – being given the Shire Medallion. Yet, remarkably, he was regarded as sufficiently ‘local’ to be included on the Shire War Memorial. Then there were the 2 men who were definitely in the district when they enlisted but not recognised: Lancelot Matthews and Norman Davis do not appear on the Shire Honor Roll and there is no record of them receiving the Shire Medallion, yet both men, prior to enlistment, were recorded in the electoral roll as living and working in the district. It seems that one man outside the district could be considered local while two others in the district were not. On the face of it, the contradiction here seems to suggest that being born in the district was more significant, in determining the status of ‘local’, than moving into the district to pursue work. It is clear that subjective assessments were made; and some men were more ‘visible’ than others. The following brief accounts cover the 7 men for whom there is anecdotal or ‘soft’ evidence to establish that they were local, even though they do not appear in the formal record sets. As indicated, most of the evidence comes from reports in the local paper. James Gunn was the first to enlist from the district. On his enlistment papers his occupation was given as driver. There is no hard evidence to tie him to the Shire. Yet, there were reports in the local paper (2 May & 13 June 1919) of his welcome home at Blackwarry where he was feted as one of the 13 men from the Blackwarry community to have served in the AIF. As part of the celebration all the men received a gold medallion, specially designed for the occasion, and donated by the members of the Blackwarry community. There is a picture below of the medallion presented. 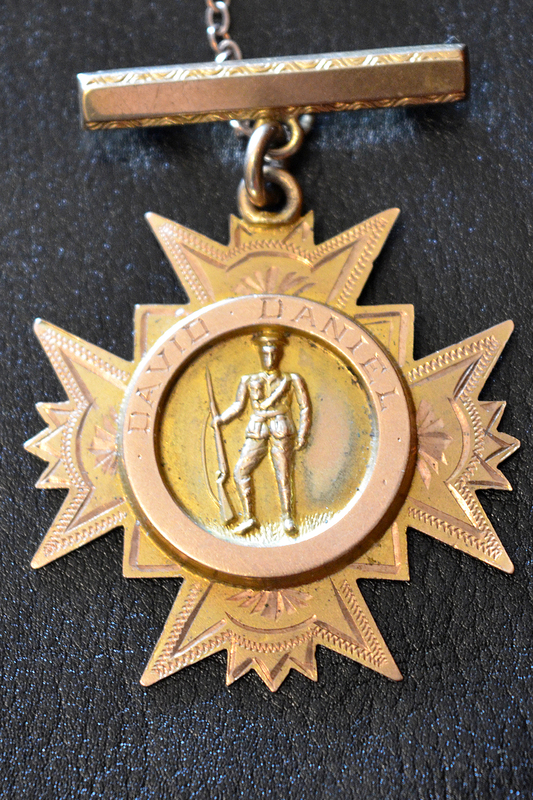 The particular medallion shown is the one presented to David Daniel, another of the 13 men from Blackwarry, who enlisted in 1916. James Gunn had undertaken military training in Traralgon prior to the War (1910-12) and it is possible that he was working in Melbourne when war started. After the War he become a soldier settler at Carrajung. Herbert George was killed in action 25/7/16. Despite the fact that there is no hard evidence to link him to the district and his name is not on the Shire War Memorial, there are references in the local paper (12/5/15, 23/8/16) which note how well known he was in the Yarram and Port Albert townships. His occupation on the enlistment papers was given as grocer but the same newspaper reports suggested that he worked in a store in Yarram as an assistant. Additionally, his name and death were recorded on the Port Albert State School Honor Roll. The case of Walter Tibbs is similar to that of Herbert George. Even if others did not see the connection to the district, his family in England certainly did because when they completed the information for the National Roll of Honor (Australian War Memorial) they gave Tarraville, Gippsland as the place with which he was ‘chiefly connected’. His parents also reported on the same form that he was an ‘excellent violinist’ and that he was only 18 when he was killed at the Gallipoli landing. He had obviously put his age up (21) when he enlisted. His occupation on the enlistment papers was given as farm worker. There was nothing to tie Milton Littlewood, another immigrant from the UK, to the district. Yet on the Embarkation Roll his address on enlistment is given explicitly as ‘Yarram, South Gippsland’. His occupation was listed as fireman. Similarly, Thomas Hart, an immigrant from Ireland, gave his address at enlistment as the Yarram Club. However there is some doubt in this case because his sister as next-of-kin gave the same address, and it is possible that he did not have a permanent address and simply gave his sister’s address as his own when he enlisted. He could, for example, have been living and working in Melbourne while his sister was living in Yarram. He was a labourer. Joseph Carlile was yet another immigrant from the UK. His occupation was gardener. He was wounded, repatriated and then discharged in late February 1916. In July 1917 he married a local girl (Margaret Marie Hopkins) in Yarram. However there is no evidence of any connection to the district before this; although there is one intriguing twist because in March 1916, just a couple of weeks after being discharged, he provided a witness statement to the Red Cross in relation to the death of a soldier from his unit – Keam (481) – and, at that time, he gave his address as Yarram. This was well before his marriage, and it suggests that there could have been a prior connection to the district. Albert Widdon does not feature in any of the hard evidence, including the Shire War Memorial yet he went to school (Devon North SS and Yarram SS) and grew up in the district. His family was still living in the district. His death was reported in the local paper (2/6/15) and the article even described Rev Cox delivering the telegram to his mother. The same article noted he had enlisted in Queensland. Another article (17/5/18) noted his name in connection with a memorial service held to honour the dead from the district. He had many cousins from the district who also enlisted. In many ways his case is similar to that of Nathan Hepburn, except that his (Widdon) name was not included on the Shire War Memorial. His occupation was listed as farm labourer. Clearly, it can be difficult establishing precisely what happened in relation to such individual cases; and contradictions and inconsistencies abound. However the more important observation from such research is that young men from a rural working-class background could easily disappear from the collective memory of the district. They were more ‘transient’ than ‘local’. This second table provides more background information on the 22 men who enlisted as individuals and outside the Shire, and in some cases well outside the Shire. The first of these men – James Gunn – enlisted on 17 August in Albert Park, Melbourne, just 12 days after the declaration of war; and the last – Albert Edward Widdon – enlisted in Dalby, Queensland, on the same day the group of recruits from Yarram left Alberton on the train. There appear to have been two distinct groups: there were men living and working in the Shire who went down to Melbourne to enlist – presumably they were not prepared to wait for any local recruitment drive to get underway – and there were men who were living and working well away from the Shire, who enlisted where they were then located. Thus Stanley Henry Hawkins, who was living at Yarram and working as a coach builder, went down to Melbourne and enlisted at Albert Park on 20 August 1914. An example from the second group is Nathan Walbourne Hepburn. He had been born in the district and went to school and grew up in the district. His parents were still living there. However, he had moved to Queensland by the outbreak of war and was working as a labourer. He enlisted in Bundaberg. The table also points to the fact that overwhelmingly the first group of individual recruits from the Shire were from the rural working class. ‘Labourers’ and ‘farm labourers’ dominate. There is only one reference to a ‘farmer’ (Samuel Gay) – and given his age, the fact that he had just moved to Queensland and the fact that on discharge from the AIF he returned to the Shire of Alberton, he was more likely to have been a farm labourer than a farmer. Only William Newland, as a ‘mechanical engineer’ stands out as someone in a semi-professional occupation. In fact, Newland is an important person as will become obvious in future posts. At the time of enlistment, he was already in his mid-thirties and he was also the only one of all the men on the table who was married. He had served in the South African War from 1899-1902 and even before leaving for overseas service held the rank of corporal. He was wounded, severely, at Gallipoli and repatriated. Most significantly, he became the recruiting sergeant for the Shire in 1915 and 1916, and was later involved with the setting up of the local association of returned soldiers. Another feature is the extent of mobility between birth and the time of enlistment. Less than half the men on the table were born in the district. Presumably they had moved in to the Shire for work. Equally, some who had been born in the district had clearly moved out of it looking for work, although possibly not on a permanent basis, by the time they came to enlist. Nearly one-third of the men had been born either overseas (5) or interstate (2). The age profile of the men is only slightly different from that for the larger group of recruits from Yarram considered in the last post. There were very few men aged 30 and above, with the concentration in the 25 or younger age group. In this instance there were fewer in the very young – under 20 – age group. As far as the religion profile is concerned, the Church of England obviously dominates. There is only 1 Catholic in the group but it is hard to draw any significant conclusions from such a small sample. Overall, the most striking feature of the group is the extent to which it is made up of single, young men from the rural working class. In this respect, it matches the profile of the large group of recruits – the ones who left for Melbourne on 21 September – analysed in the last post. Both groups show that for the Shire of Alberton the call to arms was met, initially at least, predominantly by the rural working class. The extent to which this trend continued or changed over time will be considered in future posts. Blackwarry Medallion. Courtesy of Mrs. Margery Missen, Yarram. This entry was posted in The rural working class, The War to the end of 1914 on October 3, 2014 by pcashen. Thanks for this. I’ve now corrected the reversal in the background table.